2017 was the 61st year of operation for the iconic Latvian Lutheran Church camp managed by the New York and vicinity Latvian Lutheran Church. Started in 1956, the summer camp was a complement to the Sunday schools that sprang up in the Latvian communities for children of recently immigrated Displaced Persons (DPs). Around 80,000 Latvians had fled from the return of communism and immigrated to America from 1948 to 1951. The summer camp offered their children the opportunity to come together, remember their homeland, make friends, and learn Latvian language, culture, traditions, songs, and dances. As the years rolled into the 1960s and beyond, more and more Latvians intermarried and/or graduated from college and moved to places farther and farther away from Latvian communities. None of this was surprising or unexpected in the vast landscape of America. But it presented a challenge to those trying to keep an avenue open for future generations of Latvian-Americans. They wanted to give the future generations the opportunity to learn and understand their family’s heritage and use the camp as a stepping stone to more things Latvian. The erosion of the Latvian language, a pillar of heritage, is sad, but the declining numbers of those involved in Latvian activities, generation by generation, seriously erodes what could be in the future. To address these issues, in 1983, the New York church added two weeks to the summer camp, opened the camp gate, and started “Valodas (language) periods”. These two weeks are for youth from six to fifteen who don’t speak Latvian (although some campers do speak Latvian) and want to learn Latvian culture, traditions, song, language, and folk dance and as in any summer camp, swim, play sports and games, and make new friends. Believing that they can do more, the camp committee, chaired by Anita Batarags, changed the essence and mission of the camp program last year. Their focus is on instilling even more of a Latvian heritage element in the two-week camp so the campers and counselors have a greater understanding and a stronger link to Latvian culture and country. This change is reflected in the camp title which changed from “Valodas” periods to “Heritage” periods. To help this important effort grow, the camp committee has applied for grant assistance to Latvian government agencies the last two years. Last year, they obtained funding specifically for supporting the Latvian diaspora. The “Heritage” campers as well as the 2nd period Latvian-speaking campers were introduced to the “folkloras” repertoire of singing and dancing by folk group Imanta-Dimanta. This year, the camp committee applied for funding from Ārlietu Ministrija, (Latvian Government Foreign Affairs Department), which as part of their foreign affairs program, has focused on maintaining contact with and supporting the extensive Latvian diaspora. The financial assistance the camp received paid for the travel expenses of two young women from the folk scene in Latvia: Laima Dimanta and Rasa Roze. They come from musically-talented families and both know, sing, and teach from their vast repertoire of Latvian folk songs. Both play multiple instruments such as the kokle and violin. Rasa also plays dūdas (bagpipes) and an instrument made from a metal rod where one blows in air and it vibrates in-tune. Through their music and interaction with the campers, Laima and Rasa were valuable members of the camp staff in furthering the cultural goals of the Heritage camp. To put the Heritage camp efforts in better focus, let’s start with the youngest campers, the Īkšķīši– Little Thumbs. This camp program started in 1989. For those who want to give their younger children– six years and younger– a camp experience, the first week has a week-long session for Īkšķīši. Led by Laila Gansert, each young camper must be accompanied by an adult, mother, father, grandparent (age and safety reasons). With the Īkšķīši group, the child and adult go through a parallel set of activities as the older campers. But the activities are tailored to their age, and there is more free time to explore the forest, play with polliwogs, and teeter-totter on the playground. This year, sixteen young ones with parents in tow came to experience camp life and participate in Latvian song, dance, hiking, games, and language and religion classes tailored to the young ones by Pastor Laris Saliņš. This year, camp director Elissa Millers – a teacher in her other life – celebrated her tenth anniversary as camp director. The camp staff includes pastor Laris Saliņš, office manager Gunta Ģiga, director of camp activities Austra Zubkovs, and language and music teacher Irēne Jasuta. The eighty-eight campers came from New York, New Jersey, Massachusetts, New Hampshire, Connecticut, Pennsylvania, Georgia, South Carolina, Maryland, Virginia, Ohio, and Florida. The campers were divided into four groups each of boys and girls. The oldest group had 13 boys and 12 girls. 17 boys and 11 girls made up the second oldest group. The second youngest group consisted of 13 boys and nine girls. Last, but not least, the youngest group had seven boys and seven girls. To focus on learning about Latvian historical and current personalities, the eight groups were asked to choose a cabin name from a list of Latvians, including Vaira Vīķe-Freiberga (a wise choice by the older girls), Kristaps Porziņģis (strangely, but maybe not, chosen by a girls group), Krišjānis Valdemārs, Rainis, Jeļena Ostapenko, Andrejs Pumpurs, Aspazija, and Jānis Čakste. Along with that came a history lesson about this group of Latvian leaders, athletes, writers, and poets. In their daily activities, the campers are well-supervised by twenty-two counselors. Senior counselors are usually high school seniors or college students. In addition, eight teachers (a few of them overlap as counselors), interact with the campers in art, culture, language, song, and dance. Three nurses split time at camp. There were five lifeguards. To look after the hearty appetites of the campers, invigorated by the mountain fresh air, swimming, and sports activities were run by seven workers, led by Sarma Clouser. They were helped by five kitchen aides, former campers who enjoyed the experience so much they come back to help in the kitchen. They set tables, wash dishes, and join in camp activities such as folk dancing and rotaļas as they gain experience to transition to counseling. As you drive up Interstate 87 from New York and New Jersey, the Catskill mountains start popping up about eighty miles north of the city. If you go too far, another hundred miles through the more intimidating Adirondack Mountains, you end up on the US-Canadian border and might need a passport to get home. The Catskills, compared to the Rocky Mountains or even the Adirondacks Mountains, are kind of like an īkšķītis looking up at an older camper. Nevertheless, the Catskills are more than bumps on the horizon and sneak up on you as you leave the turnpike and the rolling countryside behind. Once you start up the winding roads – surprise – the hills quickly turn into mountains! Closer to camp, you start up the road at what feels like a 45-degree angle past Rota and the Latvian cemetery and think that you are on your way to the mountaintop. But, not more than a minute later, you come to a plateau and see the first sign of the church property. The church property covers 80 acres and, along with Rota and surrounding properties, was once part of an estate owned by New Yorkers. There are a few reminders of that past. We pass by Atpūtas Nams, Rest Home. The three-story family home with a small pond nearby, where Īkšķīši can be found looking for frogs and bugs, stands by the gravel road that leads to ēdamzāle, the dining hall. Atpūtas Nams has been divided into twenty sleeping rooms, with a kitchen, basement play room, and common area, that are used by the Īkšķīši and other groups throughout the summer. Driving past Atpūtas Nams, we turn in at the main gate on the narrow-paved road that leads to the lake. But, we don’t go that far and park near the other two houses that the Īkšķīši use. Dārza Māja, Garden House, was once the home for servants. Across the road is a long, narrow rectangular, low-slung building that once was a horse barn but you wouldn’t know it unless someone told you. Now called Viesu Māja, Guest House, it was remodeled long ago and has a kitchen, living area, washrooms and showers, and private sleeping rooms on each side of the long hallway. This is our favorite place to stay – as it is for many Īkšķīši parents. Here, they can sit on the porch and watch their children play on the nearby playground, swing and teeter-totter. Today, the second week of camp there are no Īkšķīši and it is quiet here, away from freeway traffic, the hubbub of city streets and the lure of candy stores. It also is quiet because the campers are busy with their activities. With a well-manicured field on the side, we start down a tree-lined path toward the ēdamzāle. The shaded path is reminiscent of a country lane in England that leads to a manor house. Camp activity picks up here. Beyond the row of trees, a group of campers are on the soccer field playing dodge ball. Ah…it must be sports time! Group activities are sprinkled with activities for all campers, some on the soccer field that help the group of 88 bond and make new friends – regardless of age. It is heartening to hear returning campers, a 14-year-old heartily greet a nine year-old. We pass a tennis court and basketball court. Two young campers are playing their counselor in a two-on-one pick-up game. The young campers play like they have been to basketball camp. Their counselor…not so much. A group of older boy and girl campers are playing what looks to be a serious game of volleyball, until one player dives for a spiked ball and lands in the mud. There was a bit of rain this year. The laughter breaks out and rolls across the field as the player picks gobs of mud off her face. Next, we come to the ēdamzāle. It sits as a counter-balance, albeit a much smaller one, to the mountain rising high at the far end of the field from where we came. While not as impressive as a manor house, the brightly-painted white ēdamzāle building, nevertheless, is a stately presence in a sea of green, trees, mountains, shrubbery and grassy field, and seems to hint at a personality that is much more than an offer of a few meals a day. The front porch of the ēdamzāle covers the front of the building and wraps around one side. It offers a postcard view of the grassy field and mountain in the distance, framed by two flag poles and flags waving in the breeze. I take another picture. From the ēdamzāle, we head toward the nine roomy cabins. No cars are admitted in this camp area. Here we might hear happy voices of campers after lunch. Amid the cabins we pass is the activity hall from which comes the sound of folk dance music. The older group of boys and girls are gathering inside to learn Latvian folk dances. Camp leaders have scheduled 14 days of activity but it does include free time to make friends and rest time to recharge the batteries. The camp day, without rain (there are contingency plans for rainy days) starts with waking up, stretching or a jog, raising the flags and breakfast. Then it’s off to make your bed and prepare for the day’s activities. Mornings are for rotation. Each day, every group cycles through four sessions lasting around forty minutes each. These sessions are language, culture and music with Laima and Rasa, art, and folk dancing. A group of young girl campers and counselors rush out of their cabin on their way to the next rotation activity. Today, they are off to Ezermāja (Lake House) for their art period. Leaving their cabin and the activity hall behind, they follow a tree-lined path to the lake and Ezermāja that overlooks the small man-made lake. At Ezermāja, they might finish painting the rock they started yesterday, under the watchful eye of their art teachers, or work on their Latvian story quilt. Story Quilt is a Latvians Aboard Museum and Research Centre initiated project to celebrate the 100th birthday of Latvia (1918 to 2018). As shown in the picture of quilts, each camper created their own quilt. The campers were asked to think about what Latvia means to them, what images and thoughts come to mind, and what their connection is to Latvia. Some referenced family trees, trips to Latvia, love for architecture in Latvia, love for Latvia in general, and their mixed background with Latvia and different countries, and used flag designs (America and Latvia, Brazil and Latvia, Italy and Latvia). Others did their favorite Latvian symbols such as the Saule and Auseklis. Not only the quilt but the name of the quilter, his/her tie to Latvia (parents/grandparents) and a description of why the camper chose the design will be included in the one large quilt that will travel around Latvia in 2018 to commemorate the one-hundred-year anniversary. (This project is under the auspices of the Latvian Centenary Project and is supported by the State Cultural Capital Foundation and the US Embassy in Riga). Maija Hinkle, the President of the Board of the Latvians Abroad Museum and Research Center/Latvieši Pasaulē Muzejs un Pētniecības Centrs, congratulated the campers for their wonderful quilts and caring words and thanked Elissa Millers and the two art instructors: Venta Cantwell and Larisa Kirgan for a job well done. Leading away from the Ezermāja, lake, cabins, and sports fields, paths start into the forest that surrounds the camp. One path winds around the lake to the campfire site. Here, on the middle Saturday, is the much planned for and highly awaited skit night. Once everyone, campers and visitors, are settled in around a blazing campfire, the evening of camper skits and laughter follows. Intermingled with skits are Latvian folk songs that fill the forest with a hundred voices. Nearby is a different path that winds up the hillside to an outdoor church. This church of nature has a seating area carved out of the hillside, a natural stone altar, and a quiet beauty of trees and shrubs that quietly stand watch over the worshipers. Services are held there on Sundays and Wednesday evenings. Pastor Laris Saliņš leads the procession of campers– past the cabins and lake – up the hill to the outdoor church. A candlelight service follows. On the days when there is no church service, Pastor Saliņš meets with the campers before dinner. The camp staff has worked hard to create evening activities for the campers. Iepazīšanās vakars (introductory evening) brings together all campers from seven to 15 and emphasizes team-building games. There are two evenings of balles, dances, where campers build on the rotaļas and folk dances they learn during the two-weeks and try out new steps to more current music. With the recent song festival in Baltimore, the camp put on a song festival evening of their own. Lija Lūsis showed pictures and videos from the song festival. That was followed by songs, in a concert mode, that each group had worked on earlier that week with Laima and Rasa. The best group would perform in the final camp concert. The camping day includes three meals plus a snack; a rest period; swim time; and sports such as dodgeball, ultimate frisbee, soccer, volleyball or kickball. Dinner is followed by an evening activity. The youngest campers, six to eight years old, are off to bed by 9PM. The final Saturday morning is both a highlight and a lowlight for the campers and counselors. The highlight is the well put together folk song and dance concert by the campers and counselors. Their audience runs around one-hundred strong, including parents and the group of seniors, “Senči,” who have had their own week-long cultural camp in the Atpūtas Nams. The campers, led by Irēne Jasuta, have worked hard on songs and singing the second week of camp, and that shows as they shake the activity hall with a potpourri of Latvian songs. Next the campers show off their folk dancing skills. Each group, choreographed by counselors Natalie Autenzio and Emily Rose Cumings, proudly takes center stage and wow the audience and look good enough to take the dance floor at the recent song festival in Baltimore. And everyone sings, Dažu skaistu, ziedu Gaujā kaisīju, A few beautiful flowers I spread across the river Gauja – a traditional Latvian folk song. The emotional lowlight of the day of parting comes at the flag lowering ceremony when it becomes clear that the two weeks are over. No one wants to leave. But many new friends have been made. A little bit of Latvian spirit and heritage has been sprinkled about. And those young enough, vow to come back next year! What did we learn about the Heritage Camp? The two-week Heritage periods introduces, strengthens, and expands knowledge of Latvian culture, customs, folk dance, language, and song for those young people who don’t have the opportunity to participate in Latvian activities in their daily lives, at home or come from places where there is little or no Latvian activity. This camp is that catalyst that brings Latvian-American children together where they can learn about Latvian culture, heritage, history and traditions of their Senči (ancestors) – be it parent, grandparent or great-grandparent, and make friends among those who share their heritage– for life. 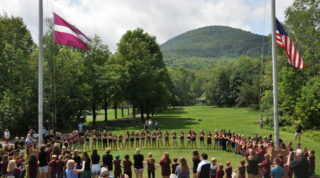 If you have a young one or know of someone who would be interested in the Latvian heritage camp please contact Elissa Millers, camp director, Anita Batarags, camp committee chairperson or Laila Gansert on the Īkšķīši email or via the New York Draudze website. We welcome suggestions on how to expand the program– including if parents or grandparents would be interested in participating by adding something of their heritage story. As fitting, the final ceremony on Saturday ended with the song the displaced Latvian people, our Senči, who fled the return of Communism to Latvia in 1944, sang in Germany and still sing in America– Pūt Vējiņi, dzen laiviņu, aizdzen mani Kurzemē. Blew ye winds, push my boat to Kurzeme. What a wonderfully detailed article about a truly magical place! I spent all of my summers there as a child and made my way up the ranks from camper to kitchen help to counselor. I am so thankful for the opportunity to have also shared this experience with my son who started as an Ikskitis, attended as a camper and this summer worked as a kitchen helper. The Heritage camp program has allowed my son to immerse himself in Latvian culture and like me, forge friendships that will last a lifetime. Kudos to Elissa and the Heritage camp staff for running such a special program, and to all who work so hard to keep the camp property as beautiful as it is! Thank you for this wonderful piece! The quilt picture is referenced in the above article but you left it out. Include it or not is your choice. But, probably would have been better to rewrite the sentence. I included two websites with specifics. Again, your choice, but the LVheritagecamp@gmail.com maybe is a bit better direct access than the other, the one you did include. Other than that, thank you. I love this. Makes me so happy this camp keeps going on and evolving. I wish I had a chance to go a kid, but my parents were of the ideology that we needed to become Americans. So we never spoke much Latvian at home. My parents still loved their native country, don’t get me wrong about that. In fact when I took my Mother back there in the 1990’s she cried, because she thought she would never see her country again in her lifetime. Even though I speak very little Latvian, I am very Latvian in my heart and soul. And my cousin is Irene Jasuta. One of the stars in your camp. Both of our fathers are buried there, side by side. I think this is really great idea and would love to see something like this in the UK.